Phishing scams are one of the largest threats to Office 365 user credentials out there. Why? Well it's one of the easist and yet most effective efforts hackers can do to obtain user credentials to provide access to corporate data. There have been a number of prominent phishing attacks targeted specifically for Office 365 in the last two years, most likely due to the huge success Microsoft has had with the platform. I was alerted to a rather sneaky new phish yesterday, where a phishing emails were made to look as if they were coming from the Microsoft. Message tracing immediately proved otherwise, but it took the user, should the user click on the link, to a sophisicated phishing site hosted on Azure asking the user to login. 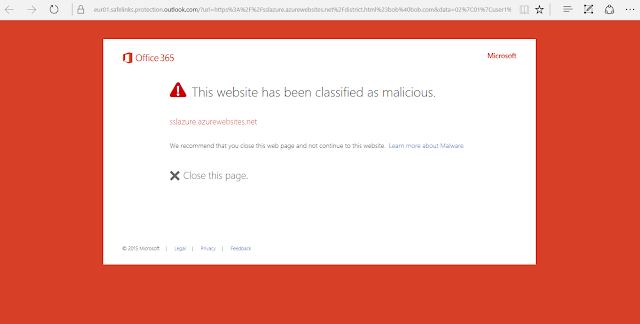 All together a clever attack, and one no doubt harvesting lots of Office 365 credentials. But what can they do with the credentials if there is no second factor authentication in-place? Well the answer to that ultimately lies in what security you have configured for your Office 365 tenancy - for example no second factor authentication but conditional access policies only allowing login from known locations or compliant devices would help - but an unlikely scenario! The most likely scenario is the attacker gains access to your Office 365 tenant through the compromised credentials. The single biggest improvement you can make is enabling multi-factor authentication, whilst you can't fully control the behaviours of your users - one can only hope they listen and comply when potentially falling foul of phishing attempts - you can strengthen their login to Office 365 by enabling Azure MFA. This service comes in three flavours, the standard free service included with certain Office 365 SKUs, Azure Multi Factor Premium and then the MFA functionality in Azure Conditional Access. It's a no-brainer, implement MFA to protect your data and user identities - this stops phishing scams in their tracks. User education is still a requirement however, users shouldn't be complicit in security just because they believe they are protected with MFA - they need to be versed in understanding attack types that could be launched against them. As should Administrators take advantage of reporting capabilities in Azure Active Directory to identify risky sign-ins and check sign-in locations, as part of daily or weekly tasks. Microsoft give you all of these features to help you protect your tenant - use them. So what other improvements can we make to enhance security for Office 365? Well Secure Score is a great start, this will provide a variety of suggestions on improving the security of your tenant. From simple things such as disabling auto-forwarding on mailboxes, or setting OneDrive for Business and SharePoint Online sharing links with expiry limits as-well-as removing anonymous access to them; to suggestions that require greater planning such as just in time access and implementing granular access with RBAC. Other improvements you can make is enabling ATP (Advanced Threat Protection), whilst this havesting website was still online I ran it through an ATP enabled tenant and ATP correctly flagged the site as malicious - note that if you are interested in ATP, this actual feature is called 'Safe Links', and needs to be manually enabled and applied. Don't forget to enable the enhanced protection it provides to OneDrive for Business and SharePoint Online documents, and Office click-to-run. Finally, with your user education initiatives in the fight against scammers, train your users to submit malicious sites or phishing scams and spam to Microsoft as well as alerting adiministrators so internal communication and technical checking processes can be completed.